VANCOUVER, BC: Raqs Media Collective, a collaborative project crossing and combing different media, comprising Jeebesh Bagchi, Monica Narula, and Shuddhabrata Sengupta, has deeply impacted contemporary culture in India and around the world. 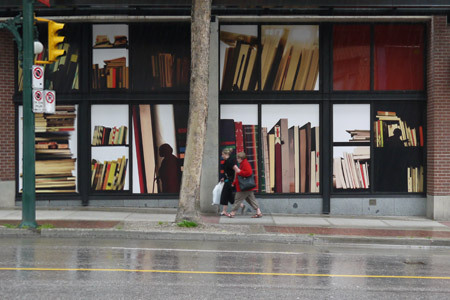 They have been commissioned by Audain Gallery, Vancouver, to present a site-specific photographic work in the large windows outside of the gallery on Hastings Street. Titled The Primary Education of the Autodidact, the work explores knowledge, power, utterance, and silence. The work directly addresses the notion and problematic of the autodidact, and also attests to the autodidacticism of the collective’s own diverse body of work and working methods. This is part of Canada’s Indian Summer Festival. 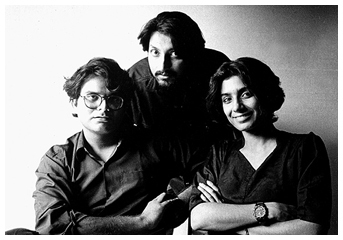 Raqs Media Collective has consistently pushed boundaries and broadened awareness about the contradictions between knowing and knowledge, between production and creativity, and between exploitation and use. The collective works as artists, filmmakers, writers, curators, editors and event organizers, restlessly exploring new forms and methods of production while preserving a consistent rigor.